Putting knowledge to work, wisely. Knowledge Management has become an ever-increasing suite of interconnected tools and techniques - it's easy to feel overwhelmed without a map. Having bounced some early ideas around with Geoff, and spent far too many idle moments at airports fiddling with PowerPoint, I think it's time to stop tweaking and start sharing. So here it is: my rendition of the KM Landscape (click to enlarge). I wanted to try and show the breadth of techniques and processes, the connections between them, and also some of our neighbouring disciplines and opportunities for boundary collaboration. It’s far from perfect (I need more than two dimensions to really do the juxtaposition justice) – but hopefully it’ll illustrate some new places to explore. Let me know if you find any new destinations, landmarks or pub walks to include. What lessons can KM learn from Minecraft? Minecraft is a phenomenon. It has around 40 million paying players worldwide, and probably tens of millions more when you count those using free or pirated versions of the game. Merchandise bearing its logos - hoodies, wallets, necklaces - can be found wherever computer game spin-offs are sold. Its Swedish creator, Markus ‘Notch’ Persson, is rapidly becoming the kind of celebrity who needs a bodyguard for public events. If you're not one of the 40 million enthusiasts, Minecraft is a popular online “survival” or “sandbox” game that puts players in a randomly-generated world where theycan create their own structures and contraptions - It's often compared to a kind of infinite virtual Lego set, which can be played in creative mode, alone or socially, or in survival mode, where the players have to defend themselves against attacks from various creatures. Gaming website G4 describes it in an interesting way, which caught my eye. "In a way, Minecraft is the exact opposite of most games out there. The focus is on exploration, not accomplishment. You can dig all day and find some gold, but the game isn't going to reward you with anything but some gold. The presentation is secondary to the gameplay itself -- your imagination fills in the blanks as opposed to an army of highly paid texture artists. Minecraft doesn't lead you through the same experience every other gamer has. What you get is yours alone." Hold that thought, whilst we swap the world of Minecraft for the world of knowledge management. I'm just finishing an assignment working with one of the largest construction programmes in the UK, advising and helping them with their approach to knowledge and learning. It's one of those times when there is no immediate "customer" for the knowledge - to there is nobody to request a peer assist, hear a set of stories or receive a baton. In this case, it's collect rather than connect. Here are the steps we're taking together. We designed some good open questions and a relaxed interviewing approach to elicit stories, examples, the basis for decisions, rules of thumb, documents, references and further contacts. The interviews were framed a chance to send a "message to the future", which helped gave a forward momentum and practical edge to the advice and examples. Each interview was recorded and fully transcribed. The interviewees concluded each session by providing a short video of their message to the future and top recommendations. The most effective ones explained their points on a flipchart whilst on camera. That gives us a significant resource of half-a million words, hundreds of recommendations, stories and examples, documents and connections to individuals. The trick now is to avoid the temptation to weave everything together into a single version of the truth, complete with ten commandment top tips and a clearly defined path which leads the learner. Instead, we need to take a leaf (block?) out of Minecraft's book and create a resource for which the focus is on exploration. That will be the best way to serve a future team with as yet unknown knowledge needs - to help them find some gold. The 12 knowledge-enabled days of Christmas! Downton Abbey, what you know, and what you're known for. Earlier this month I took my family to visit Highclere Castle in Berkshire. It is beautiful Victorian Castle set in 1000 acres of parkland, and is home to the Earl and Countess of Carnarvon. It is best known though, for its role in the TV period drama Downton Abbey which has gripped not just the British viewing audience, but audiences around the world, and particularly in the US. It’s become quite a phenomenon, nominated for four Golden Globes. As we took the tour of the inside of Highclere Castle, we were expecting to see merchandise and references to the TV series wherever we looked, given the worldwide acclaim for Downton Abbey. “This is the room where Mr Pamuk died…” “This is the spot where Lord Grantham kissed Jane…” We couldn’t have been more wrong! It would be quite possible to tour the entire castle and completely miss its starring role in the TV series! Surely a missed opportunity by the owners, the Earl and Countess of Carnarvon? What they did have on display in the huge basement was a large Egyptology exhibition which told the story of their great grandfather, Lord Carnarvon who, together with Howard Carter, discovered the tomb of Tutankhamun in 1922. That momentous discovery in the Valley of the Kings is the real story of Highclere Castle, and we got the feeling that the current Earl and Countess of Carnarvon were a little indignant that the vast majority of visitors to Highclere Castle are only there because of a piece of engaging TV fiction! It’s a perfect illustration of the difference between “what you know” and “what you are known for”. Throughout our organisations, there are hundreds and thousands of people who have real stories to tell from their past knowledge, experiences and roles – yet they are only known for their current job title. How do we enable this past experience and know-how, which often lies as buried as Tutankhamun’s tomb, to be rediscovered? As knowledge professionals, this should be one of our priorities. One way is to enable the creation of internal profiles which encourage employees to describe the interests and past experiences as well as their current position – and to embed their use in the habits of the workforce. Many organisations do this very well, notably MAKE award winners BG Group and Schlumberger. Another approach, often complimentary, is to draw out the experience of others through a collective response to a business issue for example via a “jam” session. I was speaking with Deloitte in the UK last week, and they described the success of their “Yamjam” sessions which often surface knowledge from surprising locations. The creation of open networks, and the provision of easy mechanisms for staff to join networks of their interest also makes it easy to mobilise knowledge and experience from wherever it lies. Finally, the use of knowledge cafes, world cafes and other free-flowing conversational processes will set the stage for connections and contributions which might otherwise never surface. These approaches all enable knowledge and experience from the present (what you are known for) and the past (what you know) to be shared and reused. Not only would the fictitious butler Carson approve, but also the very real Earl and Countess of Carnarvon. What's your favourite flavour of KM? Coincidentally, later that day my daughter, who is a big fan of food science, showed me a fascinating Ahn Yong-Yeol article from nature.com which used network analysis to illustrate the connections between different ingredients used across thousands of recipes, based on their chemical similarities. "This looks like those pictures you create, Dad" she said to me. A more interactive infographic based on this data is provided in Scientific American here (snapshot below). The data is sorted to show the foods who share the most chemical compounds with others towards the top. Roast beef proves to be the food that does this the most, with strong chemical overlaps with coffee, soya-bean, peanut, beer, wheat bread and butter. In a way, it's the grand-daddy of flavour. So next time you go into a pub, have some peanuts with your beer, some bread to start, with a tasty steak followed by a coffee – then chemically speaking, you’ve had a whole less flavour variety than you might think! Well, I see parallels with assumptions we make when we bring people together to share knowledge. Whether formally through structured networks and communities, or informally as people cluster around content, discussion and other attractors – my suspicion is that by default, we tend to align and gather with people with similar experience rather than different experience. In the metaphorical world of food chemistry, that means our knowledge-sharing is built on the assumption of a North American palate, rather than an East Asian one. This is why a well-planned peer assist will include sufficient diversity to avoid group-think, and why the design of communities of practice should thoroughly explore their purpose before they start recruiting members. A community focused on continuous improvement and giving and receiving technical help will benefit from being built from members with the same field of expertise - their shared practice. Communities often move along the axis at the bottom, shifting their mode from ad-hoc help and continuous improvement, to phases when the group is engaged in delivering something together (a policy, a white-paper, a set of recommendations, a good practice guide). This requires a temporary shift in leadership style, from social facilitation towards project management, but the membership is broadly unchanged. If the purpose of the community is re-defined as innovation or the generation of ideas, then you will probably want to extend the ingredients of the group to include people with a greater range of experience and different perspectives. So if we see ourselves as trusted organisational chefs (I quite like that analogy), then there are times when we need to satisfy the established tastes of our customers, and there will times when we need to educate their palates with new fusion dishes too. I've been working this week with an organisation who are looking at knowledge retention from some major programmes with a significant gap (several years) between the closure of their current programmes and the start of the next phase of projects, when today's lessons will be most relevant. Now let's be clear here - knowledge transfer is always a better starting point than knowledge capture, I think that's a given for KM. However, in this case, some kind of strategic knowledge capture is going to be necessary , as there is no guarantee that the staff with experience will be available in the future. I'm putting a brief together for them which will help them to involve the workforce in prioritising topics, conduct some media-rich interviews and create a set of knowledge assets with the needs of future projects in mind. The default position is just to let nature take its course and see what survives. Let's call this the fossilisation option. Hope that in the rough-and-tumble of organisational change, that there will be enough fragments of knowledge and experience preserved that it will be possible to reconstruct the "soft parts" (the context for decisions made at the time). Next up is the time capsule approach. Take an eclectic set of artefacts, bury them somewhere safe, and erect a memorial plaque or signpost (SharePoint folder anyone?) to remind people where things have been buried. Then hope that the person who exhumes them can make sense of the way in which each of the artefacts (documents) would have been used, and extrapolate to cover the gaps. Better than the fossil record, but still pretty unreliable. “No amount of sophistication is going to allay the fact that all your knowledge is about the past and all your decisions are about the future." So where do we find a suitable metaphor which places the emphasis on recommendations for future re-use, rather than yesterday's lessons? I found it at futureme.org. 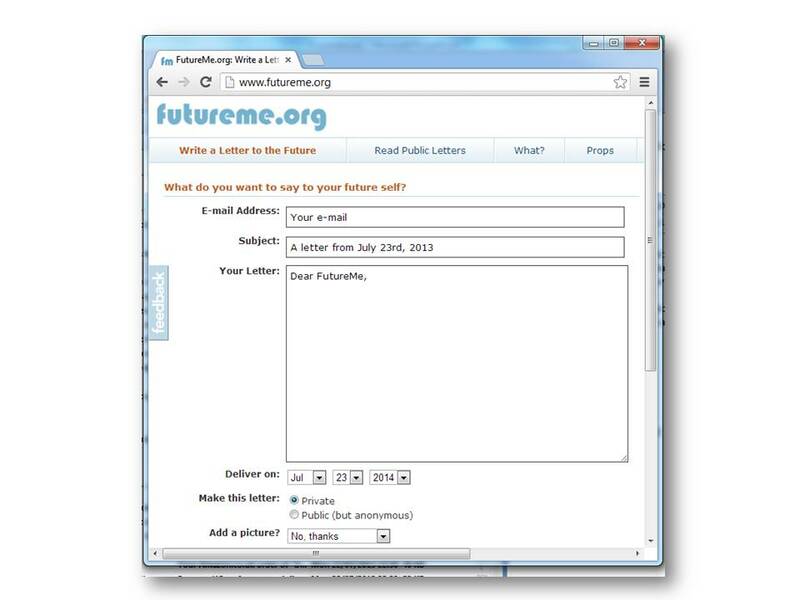 FutureMe.org is based on the principle that memories are less accurate than e-mails. And we strive for accuracy. See, usually, it's the future that will reflect back on the present. We here at FutureMe think it's fun to flip that all around. So send your future self some words of inspiration. Or maybe give 'em swift kick in the pants. Or just share some thoughts on where you'll or what you'll be up to in a year, three years...more? And then we'll do some time travel magic and deliver the letter to you. FutureYou, that is. You can browse anonymous real examples on futureme - some thoughtful, some hilarious, some prophetic and some poignant. I think the idea of sending yourself, or someone else, a message for the future is an excellent way of focusing on the capture of recommendations and thoughtful advice. It makes is personal and actionable (characteristics so often missing in lessons learned reports) - and it so much cheaper than building a museum! So we're planning to use a creative twist on futureme.org with this particular client to draw out the advice. As they say at Futureme - it's the future that will reflect back on the present, so it's fun to flip that all around. One of my current clients needs to conduct a learning review from a 2-year IT project which, by her own admission, has had its fair share of ups and downs. The project is at its mid-point, so the main customer for the learning is the team itself. They don't have much time to conduct the review (sadly just 90 minutes), so she asked me for some ideas for pre-work for the team. Sometimes you don't have the luxury of a full day to conduct an exhaustive review, so you have to work with what you have and help the team to quickly connect their hearts and minds to the review process. It's the heart bit which interests me here. When we're under time pressure, we tend to focus on the facts, the timeline, the plan, the process, contract, technology, scope and the deviations. Intellectual recall. In fact, most project review documents contain little more than this kind of intellectual recall. It usually takes a bit longer to get a team to talk about how they felt, and to draw out some the more people-oriented learning - let's call that a kind of "emotional recall". I combined some ideas from Retrospects, After Action Reviews, Baton-passing and Future Backwards (Heaven and Hell) exercises into this approach. Enjoy the ride! Before the meeting, ask each member of the team to think back over the project timeline and to focus on their emotions at each stage. You can provide them with a template like this, with key dates or milestones marked to give a sense of orientation. 1. Ask them to sketch out their own "emotional rollercoaster", paying attention to the highs and lows. 2. For the high spots, write down what went well, and why you think it went well. 3. Do the same for the low spots. What was difficult, and why do you think that was? 4. How do you think the rollercoaster is most likely to continue? Draw the continuing journey. Bring this to the meeting with your notes on the reasons for the highs and lows. Part 2 - during the meeting. Sharing the Past and Present. Collectively, in the meeting, create a large version of the rollercoaster timeline on the wall. Each participant draws their journey up to the present day, pausing to describe the lows and highs, and the reasons for these. A facilitator should probe these reasons using the "5-whys" technique to get to the underlying reason. For each high and low, ask the group to express the reason as a recommendation - something that someone else should do to repeat the delight, or avoid the despair - or an action which should be taken in order to change a process such that the good practice becomes embedded. Capture these recommendations on post-its and place on the rollercoaster. This should create a shared view of the past, and "how we got to where we are today", with some useful recommendations captured. Consider who you might share these with beyond the team. Now ask each member to sketch how they think the project will go from now to the end date. You will probably get a range of options! Focus on the best projected outcome and ask "based on all we've learned to date, what actions could we take to make this happen, rather than the less positive options?". You can take feedback from the entire group, or get them to discuss in pairs or sub-groups first. Capture these actions (with names!). Thank you ladies and gentlemen, this is the end of the ride. Please be sure to collect your belongings as you leave and don't forget to check your photo on the way out. Knowledge Management, Stories, Roald Dahl and Matilda! "Denying stories is denying the most human part of being a human. Without stories we’re just eating machines with shoes." It challenges me a bit too, as I think about the way in which organisations often treat their employees, focusing only on their current role and failing to surface their stories and experience. It's like they're "working machines with shoes" rather than people with a wealth of experience. 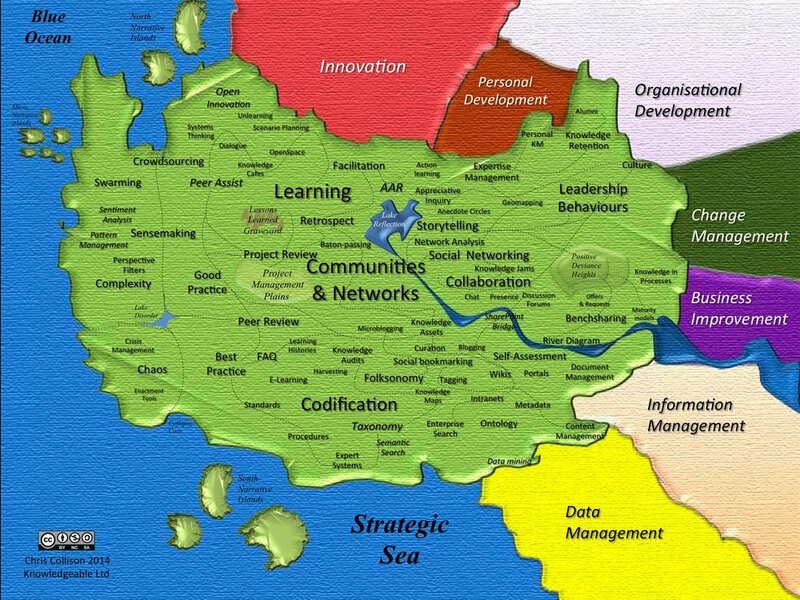 Here's a picture I ask people to reflect upon during my training programmes on knowledge-sharing, networks and communities of practice. I ask them to describe how it relates to their own organisations. They usually talk about not knowing who to connect with, not knowing where expertise and relevant experience lies, relying on serendipity, not knowing where to start (no corners or edges), lacking strategy (no picture to copy) etc. Then we discuss what it would take to turn the pieces over, so that we learn more about each others' stories. That then leads nicely into a conversation about social media, or into some practical, no-tech activities like personal social network mapping on paper (thank you Cheryl Cooper), anecdote circles (thank you Ron Donaldson), peer assists (thank you Geoff Parcell) and knowledge cafe's (thank you David Gurteen) - or a trip to the bar (thank you Stella Artois and Samuel Adams). That way, we move from being eating machines with shoes to drinking machines with stories! I'm sure Roald would have approved. Even if Miss Trunchbull wouldn't. Knowledge retention - a game of two halves. Back in the '80s, the oil company Shell ran a promotional campaign from their petrol (gas) stations in the UK which would never work today. With every petrol purchase, you were given a scratch-card, which would reveal the left or right half of a banknote, with a value of up to £5000. The half-note had no value in itself - but if you could discover both halves of the banknote, then you would receive the cash. As a child, I can remember it made those boring garage stops much more exciting! Shell's promotion relied on a good geographic separation of left and right halves of the high value banknotes. It worked well... until someone had the bright idea of asking for the missing half-notes on national radio (we're pre-internet here folks! ), at which point I think Shell cried "foul" and cancelled the promotion. I've been working on a KM/OL strategy for a company with a large number of major construction projects. I had the privilege of interviewing a very perceptive senior manager who was reflecting for the first time on the challenges of managing knowledge in a project team environment. She made an interesting observation about the power of stories as a source of shared knowledge, and the true cost of breaking up project teams to reallocate resources to new tasks. It's easy to assume that when a team dissolves, each of the members take the knowledge, lessons and stories with them. Completely. Within this assumption, every team member is a repository and can be managed and reallocated as a lossless, portable knowledge transfer approach, plugged into the next project just like a lego brick. This manager's insight was that many of the stories don't reside wholly with an individual - they only surface when two former team members come together and spark each other's memories to release the value - just like our £5000 Shell scratchcard halves. Without the other half, the knowledge value of that shared story is volatile, and at risk of dispersing into the ether. In this world there is a real loss of knowledge when a team is disbanded and reallocated - it's not all carried by the individuals. The sum of the separated parts is now less than the sum of the parts when they were together. As I write this, it seems obvious, but I have a feeling that our approaches to managing and sharing experience and expertise - and even our interpretation and use of network analysis - is often built on the assumption that we can make and break bonds and still retain all the knowledge in the nodes. I think it's a lot messier than that - as Joe Cocker and the Beatles both sang - we only get by with a little help from our friends. What stops us from putting knowledge into action? Our BMW is nearly 8 years old now. It’s been brilliant, and it’s had to put up with a lot from a growing family, and now a dog with an affinity for mud and water. Take the car to the dealer, get the problems fixed for free and the vehicle record updated on their systems. Throw away the recall letters which now have no purpose. Give the new owner the keys. It’s clear which is the better option. Now let's park the BMW analogy and think about knowledge management (which, coincidentally, BMW are also very good at). In my experience, many organisations sometimes treat lessons learned like they are an end in themselves – as though the value has to remain in the document - rather than where possible leading to actions which embody the learning. These actions might include updating a process, policy, standard or system has been updated to incorporate the learning, which removes the need to promote the lessons or recommendations to future teams. So why do some organisations settle for a pile of lessons rather than a set of improvements? It’s much easier to write a document than see a change through to completion. It’s too difficult to find the owner of the process which needs changing. I’m measured on how many lessons our project captures. We have invested in customizing SharePoint to capture lessons learned documents, and need to show that we’re using it. Although I wrote the recommendation, I’m not 100% confident that we should change the process for everyone. Now don't get me wrong, I'm not decrying any kind of activity to capture lessons learned. Sometimes the learning is such that there is no obvious process or standard which can be changed, and there is no immediate customer for the knowledge. In those cases we need to preserve it in such a way that our learning is expressed as a recommendation for the next team, and is supported with the reason, the narrative, any relevant artifacts and the contact details of the person behind the recommendation. These things all add context to what would otherwise be a recommendation in isolation. The next team then have more background to assess whether this particular recommendation is relevant in their world. I wrote about this on my February posting on dead butterfly collections. However, I do think it's worth looking at the barriers which prevent people from from translating their personal or team learning into an improvement for everyone. Perhaps we're not selling the idea of lesson-learning in the best way? Hearts and minds, or just minds? Commitment or compliance? Value or box-ticking? Let's not let the tail wag the dog!